Police in North Yorkshire will no longer be called to reports of a drug overdose - in an attempt to save more lives. The new approach has been introduced to make sure people who need help call medical services without fearing a criminal investigation. 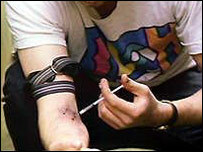 Previously the ambulance service would often call the police to drug related incidents. Now officers said they would only attend in exceptional circumstances. Cathie Gilles, North Yorkshire's drug and alcohol development manager, said many drug users delayed calling 999 in the event of an overdose because of police fears. She said: "Our key aim is to make sure that we prevent such deaths where possible. "They are a real tragedy because in many cases these deaths could have been prevented." Det Con Paul Johnson said officers would attend if there were child protection or suspicious circumstances.